Ride in cold winter conditions with this lightweight ladies heated jacket that is dual powered and great for on or off the motorcycle. The Mobile Warming black heated jacket uses a rugged Windshark outer shell combined with heating panels located in chest, back, and arm areas to deliver plenty of heat where you need it. To Activate the heat on your Mobile Warming Dual Power 12v Jacket simply connect into the motorcycle power lead through a convenient 12v adapter that hooks up to your motorcycles battery and then to the jacket. When not on the motorcycle heat can be delivered through a rechargeable remote battery that fits into the pocket and can heat up the panels in the back and chest for an average of 6 hours allowing you to do a full range of activities when heat is needed. Ride in cold winter conditions with this lightweight heated jacket that is dual powered and great for on or off the motorcycle. 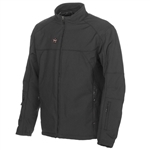 The Mobile Warming black heated jacket uses a rugged Windshark outer shell combined with heating panels located in chest, back, and arm areas to deliver plenty of heat where you need it. Ride in cold winter conditions with this lightweight heated vest that is dual powered and great for on or off the motorcycle. 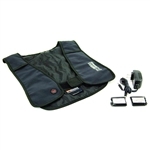 The rugged Black Windsharkᴿ outer shell combined with heating panels in chest and back deliver plenty of heat where you need it making the black mobile warming dual power 12v vest a must for any motorcycle rider. To Activate the heat on your Mobile Warming Dual Power 12v Vest simply connect into the motorcycle power lead through a convenient 12v adapter that hooks up to your motorcycles battery and then to the vest. When not on the motorcycle heat can be delivered through a rechargeable remote battery that fits into the pocket and can heat up the panels for an average of 6 hours allowing you to do a full range of activities when heat is needed. 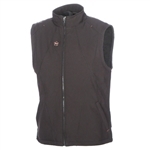 Ride in cold winter conditions with this lightweight heated vest, designed with a universal fit, lightweight style great for under a jacket to keep you warm and cozy. Thawdaddy delivers long-lasting instant heat on-demand. The Thawdaddy Vest by Mobile Warming features 3 heating panels to provide heat in all the right spots.